For such combinations to work, however, they need to be chosen with care. Firstly, let's not forget that cheeses should be “presented” and tasted in a proper sequence so as not to make the mistake of starting with the strongest tasting cheese, which would result in the taste of the subsequent milder ones being lost. 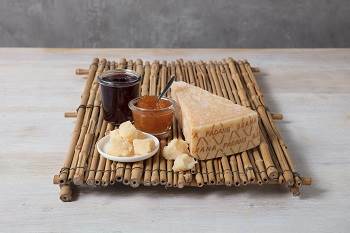 Different cheeses should also be served together with care, taking into account the type of milk (cow, sheep or goat milk), the type of cheese-making process (raw milk, cooked milk, string cheese) or a given theme, such a regional cheeses, the ageing period for the same type of cheese, and so on. Apricots and black tea, designed to be paired with less mature Grana Padano, aged for fewer than 16 months. previous: Which beers should be combined with Grana Padano PDO?